Throughout history, all shades of purple have been the exclusive property of royalty and the very rich. 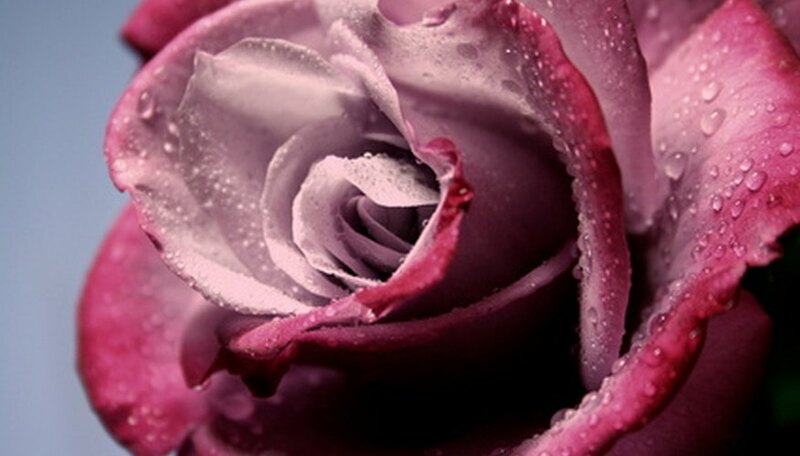 Even today, many people think of purple and lavender as special colors, especially when it comes to roses. In the language of flowers, lavender roses mean "love at first sight." These flowers are far from rare anymore, and there is a good variety from which you can choose to add to your rose garden. Enchanted Evening is a fragrant lavender floribunda rose, which means that you will get many blooms along the branches of this 4-foot bush. The flowers are mauve to lavender in shade, and the scent is a bright citrus. Enchanted Evening is good in borders and mixed beds, and does well in container gardens. Ebb Tide is a deep lavender floribunda that blooms throughout the growing season. It grows 3 to 4 feet tall and does well in USDA hardiness zones 4 through 9. Ebb Tide smells of spicy cloves and has almost 40 petals on each of its full blooms. Ebb Tide does well in mixed borders and makes a colorful hedge along a property line. Neptune is a hybrid tea, which means that the blooms grow on long stems with glossy leaves, ideal for cutting for bouquets and vases. Neptune's flowers are a clear lavender with a tint of purple on the edges. This variety has a strong classic rose fragrance and an upright, bushy growth habit. Wild Blue Yonder is a grandiflora rose that was introduced in 2006. The full, ruffly blooms are reddish-purple on the outside with lavender-colored inner petals. Wild Blue Yonder is a bushy plant that grows up to 5 feet tall and does well in zones 6 through 9. What Is the Meaning of the Lilac Flower?